Summer is here in full force, but with the blast of heat comes the opportunity to bond with your kids as schools close for the season – or, if you are single or a young couple, the chance to take a break and be with yourself for some me-time, or with your spouse for some us-time. Whatever it is, there’s one constant: summertime is vacation time, and a reason to travel. 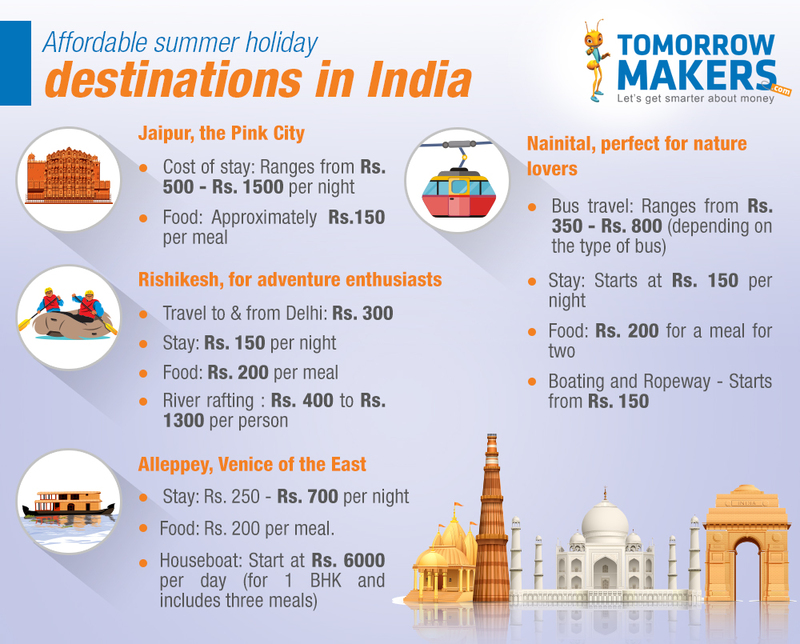 In India, we are spoilt for choice when it comes to selecting a travel destination. If you wish to chill in cool climes, the hilly regions of the north and the north-east could be the answer. If you prefer beaches and sunshine, the south of the country should appeal. If historical places draw you in, western and central India fit the bill. The big question is: how does one make a travel programme on a shoestring budget? First of all, wherever you go, be advised to check the temperature at your destination before you leave: a rainy May evening in Darjeeling can be around 20 degrees, so carry something warm, if light. Ideally, suitable apparel should only be a small part of your preparations, but if you’re underprepared, you may end up spending unnecessarily on new garments, draining your wallet in the bargain. So it is advisable to pack wisely. You should also find out the dress codes of holy places you plan to visit. There are Jain temples that do not allow leather belts, so you should pack something that doesn’t need one, like a pair of track pants. Also, if you are planning to visit holy places, wear flip-flops or sandals; you may have to leave your footwear outside, and cheap footwear minimises the chance of theft. Carry a sufficient amount of cash as there may be shops, especially roadside stalls selling local handicrafts, that may not accept cards (remember, the same products sold at bigger shops or even the state-owned emporiums often cost more). Plan and complete your hotel and travel reservations well in advance as last-minute bookings can bleed you financially; this means you should plan your itinerary in advance. Not all places are accessible by air, or if they are, air travel could be very expensive in the holiday season. So become familiar with the IRCTC website and be prepared to travel by train. If you are covering great distances, try to travel overnight and reach by morning/midday. This has two major advantages: (a) your travel will be cheaper than that by air, and (b) if you time it right, you can check in at the hotel around noon, which is also the check-out time in India, and avoid paying extra. Also, you can utilise a maximum amount of daytime for sightseeing. Be ready to try the local fare, as these will be readily available at smaller eateries which are naturally cheaper. This is India; haggle over prices whenever possible. This goes for local travel too. Travelling by train is cheaper than flying, but it can often be very tiring (train journeys lasting 24 hours or more are not uncommon in India). As a result, there is a growing preference for air travel. Also, in this era of budget airlines, there isn’t much difference in the cost of flights vis-à-vis first class train travel. On top of that, flying has become so much easier in recent years. Unlike in the past when you kissed your flight goodbye if you lost your ticket, today, with e-ticketing in vogue, a flier needs to just state their name and show an ID card, and a fresh ticket printout will be made available. But there are some things you must remember when it comes to flying: first, do not for a moment think you are getting the best deal just because you booked using a travel app; make sure you clear the cache and cookies from your browser before making the payment. Airlines track app data and hike prices when they realise you are serious about booking a ticket. You could browse in incognito mode to prevent sites from tracking your browsing history. Also, do not check the fare repeatedly as it will increase within minutes if you do so. It is for the same reason that you should ideally do individual searches and purchase tickets separately for each member of the family. This may involve some work, but it is worth the effort as airlines are known to jack up prices when several seats are bought in a bunch; booked individually, tickets come cheaper. Secondly, flying a budget airline is not an end in itself; it is just one of several factors that help lessen flight costs. Try to travel for an hour or a day when demand is the least: book midweek flights (Tuesdays and Wednesdays) and avoid the weekends, including Fridays. Similarly, target late-night or early morning flights; it can make a huge difference in ticket prices. The third strategy is an extension of the previous: choose a very early morning connecting flight instead of a direct one; this too can help you save money. This is how it works: if you’re travelling from Kolkata to Delhi; choose a flight from Bangkok to Delhi or beyond that has a Kolkata pit stop – the airline will be happy to fill the just-vacated seats to you at discounted rates, rather than fly empty to Delhi. It is a win-win for both you and the airlines. Fourth, use the referral programmes offered by online travel companies such as MakeMyTrip and Goibibo, where you are credited ‘referral money’ for recommending the company to friends, who have to download the app. Use the credits to get discounts on tickets. Note that this works only for new members you have added. Related: USA? Europe? Kerala? 5 Ways to take that vacation this summer! The fifth is really a precaution against excess payment: travel light and avoid getting penalised for excess baggage. On domestic flights, each passenger is allowed to carry 15 kilos of check-in baggage and about half that as carry-on. However, you might find some airline tickets at a much lower rate. This could be because they allow only cabin baggage (7 kilos). So, if you are not carrying much luggage, these tickets would make more sense. On the contrary, avoid booking these tickets if you have luggage exceeding 7 kilos or check in bags. Finally, book your tickets at least three months in advance, and during the off-season. But assuming that you have just decided to travel this summer, try booking a flight from an alternative (and nearby) airport: it may be cheaper to fly from one slightly further away. However, keep in mind that airport taxes may be high at certain airports and that some low-cost airlines may be available from other cities. So, do your research and try as far as possible to keep your dates and travel plans a bit flexible. If you can stand long journeys, India is a magnificent country best explored by train; it brings you face to face with a riot of colours in scenery and ethnic wear, and cultures and cuisines that change as your train trundles through different states. But before you pack your bags and leave for the station, there are several things you should take care of. If you have a waitlisted ticket check your booking status frequently as the date of journey approaches – the final chart is only prepared some hours before the scheduled departure of the train. You can do this online. This way, you avoid being caught on the wrong foot at the station in case your reservation has not come through, leaving yourself at the mercy of touts or greedy ticket collectors. Make sure you have bought your return tickets as well, because booking during travel can be costly, either on the Tatkal service or through travel agents or touts. Before you leave for the station, you should check which platform you are required to board your train: helpline numbers are 131 and 133. Note: this step is particularly important in large stations like Mumbai CSMT or Howrah – you may need to walk a great distance to reach your platform, and thus run the risk of missing your train. Availability of clean drinking water can be a problem during long-distance train travel, and it is advisable to buy bottled water only from authorised kiosks at stations and not from hawkers inside the train, which can be suspect; you don’t want to fall ill in a new city and tot up an unexpected medical bill, do you? If you are keen on exploring budget options for a relatively inexpensive stay near the station, railway retiring rooms, which are available at all major stations across India, are a good alternative. Economically priced, these provide clean and safe accommodation. The IRCTC website will have more details. Finally, food during the journey. Food services provided by the Indian Railways have evolved in recent years, though sometimes the private caterers mess up in terms of order and quality, and clearly over-charge. Alternatively, pack your own dinner; it is definitely cheaper and more filling. Once your travel is taken care of, the next important thing to look at is accommodation. Here too, you can save money if you go about it the right way. For instance, you’ll be flooded with discount offers on hotel rooms if you decide to take the online booking route using travel apps. Credit card companies and banks too have tie-ups with hotels; so if you use these cards, you will be offered discounted rates on rooms. But if you don’t like online booking and instead prefer booking directly, it pays – no pun intended – to negotiate the room charges with the hotels before your stay commences. You should be able to get a discount of at least 15% on printed room rates. Also, do not hesitate to ask questions about hidden charges; make sure there are none. Nowadays there are various hotel reservation websites such as Trivago and HotelTravel where you can check the lowest price, and which offer discount coupons on hotel rooms. Many of these websites also offer last minute discounts, so do your research and grab the opportunity. HotelTravel can be contacted via private message on their Facebook page; they usually have a lot of promotions going on. You could also try booking a homestay – private accommodation with a local family, or service apartments. These fully-furnished rooms are available for both short and long stays; they provide hotel-like amenities such as room service, with additional facilities like a fully-equipped kitchen and washing machine. There are several websites/aggregators for hotels, BnB (bed-and-breakfast) accommodations, and vacation rentals that cover serviced residences; you will have to search online. India is an incredibly diverse, interesting, and affordable place for tourists – yes, even domestic ones! Most places are inexpensive if you know the right way to go about planning your trip, and you will never run out of things to do or see. The process may have its share of hassles and annoyances, but if you plan well ahead, you should be able to take it all in your stride. Happy holidays!